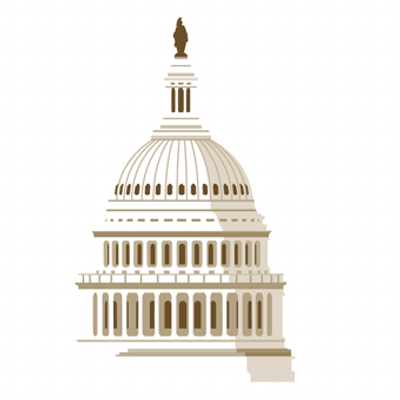 The Constitution directs that the president “from time to time give to the Congress Information of the State of the Union, and recommend to their Consideration such Measures as he shall judge necessary and expedient.” There is no requirement that he do so in person, but for over a century now our presidents have routinely done so. It is one of the presidency's more monarchical rituals - and hence one which most presidents delight in. President Trump, delivering his first State of the Union, would seem to be no exception. George Washington started the tradition, undoubtedly attracted to its monarchical resonance as a way to invest his office - and by extension his infant country - with some semblance of seriousness and dignity. Offended by its transparently monarchical resonance, however, Thomas Jefferson then abandoned the practice. It remained abandoned until Woodrow Wilson, who undoubtedly fancied himself as some sort of crypto-monarch happily restored it. However, in comparison with Throne Speeches at the Opening of Parliament in modern European monarchies, the State of the Union is at best a modestly successful imitation. Meanwhile our civic dignity has eroded and become increasingly corrupted, while the presidency has evolved into a Napoleonic, imperial institution almost without parallel. The result is an event that, while it aspires to suggest lofty dignity and civic sensibility, has turned into a vulgar celebration of the depths to which our civic culture and political institutions have descended, as rival camps of politicians jump up and down on cue (or sit still) to be seen by their "base" to make their point. It was President Ronald Reagan who 1982 started the strange custom of calling attention to guests in the balcony, when he praised a hero from a recent Potomac River plane crash. This stunt has now become standard State of the Union fare, as if the President's Annual Message were a politicized version of the old Ed Sullivan Show. (In that Sunday evening variety show from TV's early years, host Ed Sullivan routinely invited prominent people in his audience to stand up and be recognized.) It could, of course, be argued that this custom has added a "populist" component to an otherwise elitist event - recognizing and invoking the example of heroic or otherwise worthy ordinary citizens. Whatever one thinks of this practice, however, President Trump seemed to take it to a new level. There were so many balcony appearances that the speech itself seemed almost secondary interludes between the balcony appearances - one reason it was one of the longest State of the Union speeches ever (longest not in words but in length of time).. On the other hand, focusing on so many people in the balcony lessened the focus on the President himself, not necessariiy what one would have been expecting. The speech lacked the flamboyance of much of Trump's campaign oratory. In this it was more like his last address to Congress, and in this era of lowered expectations may have come across as "presidential." Even so, it seems striking how even the President's calmer, more measured language still expresses what I suspect is his authentic view - a depressingly grim, fearful conception of American life and of the world beyond. That frightened - and frightening - world view is a key component of the President's destructive hostility to immigrants and almost anyone who seems in some way different from the ethnic composition of his narrow "base." In the nature of the case, a televised State of the Union is an appeal over the heads of the political elite to a larger national audience. Its impact on the latter is what may matter most and in turn influence the politicians robotically jumping up and down inside the House Chamber. It remains to be seen what actual effective congressional actions will result from this sorry spectacle. 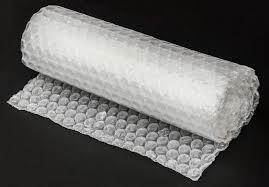 The last Monday in January is - believe it or not - Bubble Wrap Appreciation Day! The story is that, when some radio station in Bloomington, Indiana, received a shipment of microphones wrapped in bubble wrap, the sound of the wrapping being "popped" (something some people really enjoy doing with Bubble Wrap) was inadvertently broadcast. The story certainly seems silly enough to be true - silly enough too to create a special day to commemorate it! Bubble Wrap the trademarked name of the plastic material widely used for wrapping and packing fragile items, its characteristic air-filled bubbles creating a cushioning effect. Apparently its inventors had other uses in mind but discovered its superior virtues as a wrapping and packing material. But, because the bubbles make a nice popping sound when squeezed and broken, it has since found additional uses used as a plaything - and stress reliever. Supposedly, Sealed Air (the company that owns the trademark) may be making an alternative wrap that does not pop. Why? Why take the fun out of unwrapping packages? Certainly Bubble Wrap is good at what it does. And, if it adds a little amusement to our ordinary lives by being popped, so be it. No harm done! But really what more is there to say? What more does anyone need to say? What more should anyone want to say? Friendship, Aristotle famously said, is one of those things without which life would be unbearable. That is no less true in religious life than anywhere else. 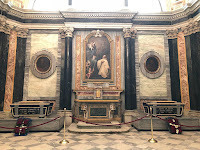 So it is fitting that today the Church commemorates two of Saint Paul's close friends - his companions and co-workers Saints Timothy and Titus. The first reading at today’s Mass (2 Timothy 1:1-8) reflects Paul’s feelings for Timothy and his family: I remember you constantly in my prayers, night and day. 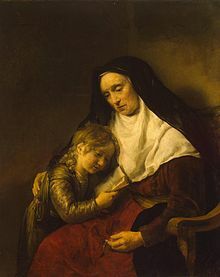 I yearn to see you again, recalling your tears, so that I may be filled with joy, as I recall your sincere faith that first lived in your grandmother Lois and in your mother Eunice and that I am confident lives also in you. Timothy is mentioned several times, both in Acts and in Paul’s Epistles. Famously, Timothy had some sort of stomach problem, for which Paul advised him to switch from drinking water to drinking wine (1 Timothy 5:23). According to tradition, Paul put Timothy in charge of the Church in Ephesus. Unlike Timothy, Titus was unambiguously a Gentile, a Greek probably from Antioch, which was why he remained uncircumcised as a Christian. Having been converted by Paul, he served as Paul's assistant and accompanied Paul to the famous Council of Jerusalem. According to tradition, he became Bishop in Crete. In this hyper-individualistic culture, in which stardom and celebrity seem capable of corrupting and impoverishing almost everything, the genuinely human friendships which Paul enjoyed with his colleagues in ministry may be a useful model for all of us to recall, both for our personal benefit and as a corrective to the individualistic imperatives that seem to surround us. The pre-conciliar Roman Calendar assigned Saint Timothy to January 24 and Titus to February 6. The Pauline revision combined their feasts into one and assigned them to the day following the Conversion of Saint Paul, January 25. That date too is somewhat arbitrary, of course,. Most likely January 25, then the Octave of Saint Peter's Chair at Rome, was originally celebrated as a feast of the Translation of Saint Paul's Relics. Eventually, it evolved into a commemoration of his conversion. Interestingly, Pius XII's Pontifical Commission for the Reform of the Sacred Liturgy, which paved the way for the pre- and post-conciliar liturgical reforms, discussed abolishing the feast of the Conversion of Saint Paul in 1954. Although the post-conciliar revision did some really radical surgery on the calendar, boldly abolishing things no one had ever expected it to abolish (e.g., Septuagesima, Ember Days, the Octave of Pentecost), somehow the Conversion of Saint Paul survived! Hence today's commemoration of his friends. Awesome (in its authentic - not its frivolously contemporary - meaning) is the right word to describe the interior of our new soon-to-be-dedicated diocesan cathedral, which I and some others took a tour of today - awesome as in the traditional Introit of of the Mass for the Dedication of a Church (cf.Genesis 28:17): Terribilis est locus iste; hic domus Dei est, et porta caeli; et vocabitur aula Dei. ("Awesome is this place; this is the house of God, and the gate of heaven, and it will be called the hall of God." In an era when so many public buildings - including far too many contemporary churches – are better known for their banality and ugliness than for their beauty and dignity, it is a true joy to experience Knoxville’s glorious new cathedral, designed and built so as to leave no doubt as to its purpose and the solemnity and importance of what takes place inside it. This is immediately apparent when one first looks down the nave from the narthex (the liturgical "west") to the sanctuary, or when one looks up from the sanctuary at the dome, or when one looks again down the nave to the sanctuary but this time from up in the choir loft, or when one stands in the sanctuary and admires the Tabernacle beautifully set in the apse (the liturgical "east."). The bishop's cathedra is located in its traditional location on the "gospel" side (the liturgical "north"), while the pulpit faces out into the nave from its traditional (for cathedrals) location on the "epistle" side. Naturally I was eager to try it out! Leaving this glorious new temple of the Lord, I was reminded of these words of the great Saint Augustine (354-430), if our minds be faithful and attentive, and our lives just and holy, all that is done in temples made with hands will be fulfilled in a spiritual building also within us (Sermon 252). For what it may be worth, in my opinion Call Me By Your Name, Darkest Hour, Dunkirk, and The Post are all deserving candidates. If I had to choose a Best Picture, it would probably be a tie between Dunkirk and The Post. In addition, Lady Bird is a girl's coming-of-age movie, which is well worth seeing. If the choices were to be narrowed to five, as they used to be, those would be my five. I generally avoid horror films, and so I did not care to see Get Out. But I did watch it recently on TV because, having heard so much celebration of it, I figured it might be nominated. And, of course, knowing the story already, the horror dimension was eliminated, and I could focus on the racial dynamic, which is what it probably owes its nomination to. The fact that films often owe their nominations to socio-political-cultural considerations comes as no surprise. The question is which socio-political-cultural considerations will frame the choices. My four top choices are all set at critical times in the 20th century - Darkest Hour and Dunkirk in 1940, The Post in 1971, and Call Me By Your Name a decade later. Since today happens to be the anniversary of the death of Sir Winston Churchill (1874-1965), I'll start with the two World War II films. For me - born in the early post-war Baby Boom - World War II was a recent memory for my parents' generation (the "Greatest Generation"). War movies were an omnipresent staple, as indeed the memory of the war and its lessons - real and imagined - forcefully framed the politics of the time. I still enjoy war-related documentaries on cable TV. The "Greatest Generation" is fading now, and there are no national or world leaders left from that era (with the one significant exception of Queen Elizabeth II). Still the war continues to fascinate. I think that reflects a yearning for a time when the issues were clearer, a time also when the nation was largely united in a common purpose, and when top-quality leaders arose to meet the need - leaders like FDR, Churchill, DeGaulle, etc.). We can look back to them and their time not just with nostalgia but wishing some of what made them and that time so great could be recaptured today. For sheer cinematic virtuosity, Dunkirk deserves pre-eminence, but both Dunkirk and Darkest Hour capture the challenge and the greatness we associate with that wartime experience. The former highlights heroic and principled political leadership (so sorely lacking now). The latter highlights the struggles and heroism of ordinary soldiers and civilians, thrown together in a life-and-death struggle to salvage civilization. I wrote about The Post just a little over a week ago and need not repeat myself here. It captures a critical moment in American history when society had to reckon with decades of deceitful government policy that had brought about a military calamity abroad and a breakdown in our civic culture at home. The movie recalls the start of our increasingly mutually adversarial political culture and the part played by the press in that development. And it also offers a moving account of one woman's transformation from conventional society wife to something she herself had never expected. For all these reasons, it certainly seems to speak directly to today's current cultural climate. Call Me By Your Name is a well acted gay boy's coming-of-age drama set at a specific moment in the rapidly evolving experience of gay people in Western society. The story is set, however, in an almost unreal setting, quite unlike that in which most gay people (or for that matter almost anyone else who wasn't super talented and, above all, rich) actually had to function at that time. (Its location is Italy, but almost the only Italians we see are a few servants, and it could just as realistically be set almost anywhere - or on the moon.) But the seriousness of the film's subject and the profundity of the performances explain its inclusion among the nominees. 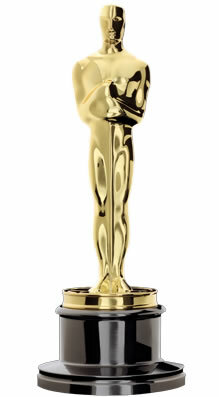 Of course, the Oscar could just as likely go to one of the movies I haven't seen! The mortal remains of Italy's third King, Vittorio Emmanuele III (1869-1947), who reigned from 1900 to 1846, and his Queen, Elena of Montengro (1871-1952) have been reunited at last - back together and reunited with Italy. 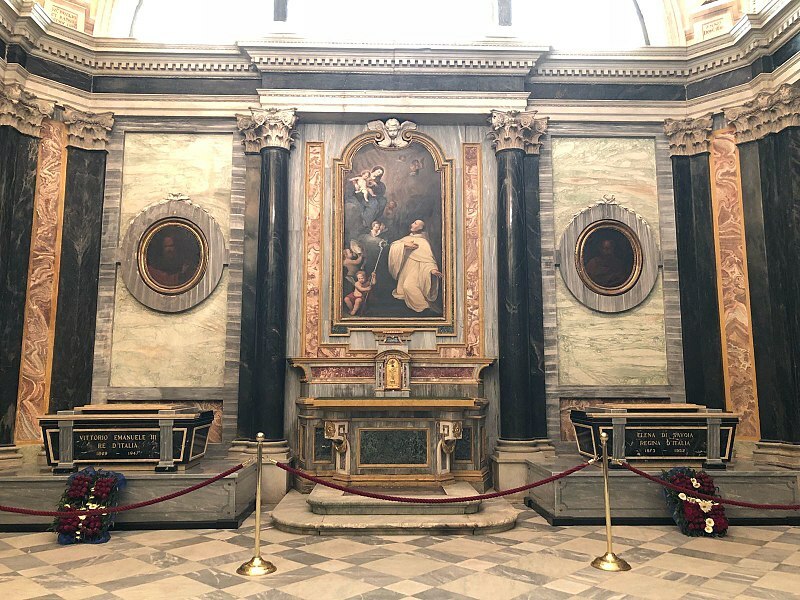 Without fanfare, almost furtively, the two monarchs' bodies were returned to Italy and were reburied last month in the chapel of San Bernardo (photo) in the Santuario di Vicoforte in the Piedmontese province of Cuneo. Queen Elena was reburied first, on December 15, returned to Italy from her resting place in Montpelier, France. Then two days later her husband was brought home from his tomb in Saint Catherine's Cathedral in Alexandria, Egypt. Unlike the king, whose legacy remains problematic, Queen Elena was widely beloved and respected all her life. At the time of her death, Pope Pius XII called her a "Lady of Charitable Work." In fact, the Queen had twice received the Golden Rose from Pius XI - in 1930 and again in 1937 - the only modern person I know of who received it twice in her lifetime.. (The only person to have received it more times was England's King Henry VIII - in 1512, 1521, and 1524. A lot of good that did!). Known as il Re Soldato ("The Soldier King") for having led Italy during World War I, he was subsequently called il Re Vittorioso ("The Victorious King") after Italy's victory in that war, which wasn't much of a victory as it turned out, and which set the stage for Italy's - and the House of Savoy's - ultimate undoing in World War II. More derisively, he was widely known as Sciaboletta ("little saber") due to his diminutive (5-foot) stature. The trajectory of his reign could be said to have taken a wrong turn when he appointed Benito Mussolini to head the Government in 1922 and, for the most part, passively went along with Fascism at home and with Mussolini's disastrous foreign policy. Undoubtedly, there were many points at which things could have gone differently. Initially Mussolini's rule was well regarded by many outside Italy. He successfully sent troops to the Austrian border to prevent Hitler from annexing Austria in 1934. The conquest of Ethiopia, however, damaged Italy's relationship with the Western Powers and paved the way for the alliance with Germany, in which Italy became increasingly the very junior partner. Like many Italians, the King did not care much for the Germans. He certainly disliked Hitler when he came to Rome for a State Visit in 1938 (a dislike Hitler reciprocated). But he unwisely went along with the Declaration of War in 1940. Even so, the monarchy remained a popular counter to Mussolini, who never enjoyed the absolute power Hitler did in Germany, The military, for example, swore allegiance to the Crown, not to Mussolini, and would probably have always supported the King had he moved against Mussolini earlier than he did. In the end, the King did act to remove Mussolini and realign Italy with the Allies in 1943, but he did so in a blundering and ultimately disastrous manner. The infamous fuga del Re - the flight of the King and the Government from Rome on September 8-9, 1943, leaving Rome effectively undefended from the Germans - has forever blackened his reputation. "What a spectacle," the King's son, the future King Umberto II, lamented as the royal family fled. When one Italian General realized that their flight was not to the hills but to the sea (so as to head south behind Allied lines), he supposedly said,"So far it has been a flight., Now it is an absolute betrayal." Historians will continue to debate the pros and cons of the King's actions before and during the war. What is beyond doubt is that his stubborn refusal to abdicate in 1943, when virtually everyone wanted him to do so, undermined the dynasty's position in post-war Italian politics. During his almost two years as regent and his one month as King, Umberto II showed himself well suited to the demands of the job. Just as Mussolini would likely have remained in power and ended his days peacefully had he not entered the war, likewise Umberto II would likely have remained on the throne as a stabilizing force for post-war Italy had his father gotten out of the way and left the scene more quickly and with more dignity. The extremely narrow (and questionable) republican victory in the 1946 referendum not only highlighted Italy's persistent sectional (north vs. south) divide but also largely returned Italy to the dysfunctional political patterns that had paved the way for Mussolini's ascent in the first place. The monarchy was not the only counterweight to Mussolini. The Catholic Church had infinitely more charisma than the very uncharismatic "little king." Even so, the monarchy deserved better than the fate it suffered from the post-war finger-pointing and virtue-signalling, to which admittedly it had become so susceptible thanks to Vittorio Emmanuele's personal failures as monarch. 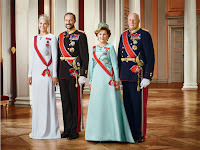 To the extent, however, that the monarchy was an (at least partially effective) institutional counterweight to Mussolini's malignant populist politics, it remains a reminder of the importance of historically stable traditional institutions - especially in this post-modern era of resurgent malignant populist politics (and not just in Europe). As with so much of the legacy of the 20th-century's two terrible wars, it all could have ended better than it did. History happens, however, and once it has happened nothing can un-happen it. At least the King and Queen are together again and together too with Italy, united as they were in life, for better or for worse. In this season of new beginnings, just three weeks into a new year, the Church today recalls what we might call the organizational beginning of Jesus’ public mission – with Jesus’ call of Simon and Andrew and James and John to be apostles and missionaries, the very core from whom the Church would expand and grow. Today’s Gospel must surely be a Religious Vocation Director’s dream text! Not that I would ever be likely to serve as a vocation director, part of the job description of which is presumably to be young and thin. Nor have I ever been much called upon to give Paulist Appeal talks, which is what is supposed to happen today. Some of you may have come to Mass today expecting to hear your former Pastor, who will be celebrating his Golden Jubilee, 50 years as a priest in 2018, and who was scheduled to be preaching our Paulist Appeal today. Unfortunately he is in bed with the flu. So you’re stuck with me instead. Be that as it may, today’s Gospel is indeed a Vocation preacher’s dream, and so it is an easy transition to speak about a particular vocation – that of the Paulist Fathers – and to ask all of you who are here today not necessarily to become Paulists yourselves (although if there is anyone here who fits that profile, let’s talk later) but to offer your support to the Paulists – as people in this parish have done so consistently and so generously ever since the late Fr. Tom Connellon came to Immaculate Conception in 1973 as our first Paulist pastor. By the way, one of the best Vocation-Promotion-Recruitment films ever made was Fisher of Men, our own Paulist Vocation-Promotion-Recruitment film from the early 1960s, which takes its title from Jesus’ famous words in today’s Gospel. It was written and produced by the founder of Paulist Productions, as a "day in the life" of a fictional Paulist priest (played by Brian Keith, the star of the 961 movie, The Parent Trap), with scenes filmed at out Paulist parish and at our university ministry in Los Angeles. It is visually very dated obviously, but still well worth seeing. One of my own favorite vocation stories is from the 4th century. In 391, Saint Augustine, then 36 years old, but baptized only 4 years, visited the North African town of Hippo. Knowing Augustine’s reputation as a talented orator, the Bishop, Valeriaus, took advantage of his presence to say that, because of his age, he needed the assistance of a younger priest, who was a good speaker. The congregation took the hint; grabbed hold of Augustine; and refused to release him until he agreed to be ordained! Like Saint Augustine, our 19th-century Paulist founder, Servant of God Isaac Hecker, also told his own account of his own personal journey – how God led him into the Catholic Church and then inspired him to devote the rest of his life to leading others there as well. Often in my boyhood, Hecker wrote, when lying at night on the shavings before the oven in the bake house, I would start up, roused in spite of myself, by some great thought … What does God desire from me? … What is it He has sent me into the world to do? These were the ceaseless questions of my heart, that rested, meanwhile, in an unshaken confidence that time would bring the answer. But none of that happens automatically. When the Paulists started they were just four in number and had the immediate task of building a brand new parish, church and all, from nothing. So they sent out an appeal, announcing their hopes and plans, and asking for contributions to buy land and build on it. A lot has changed in the world in 160 years. But that hasn’t. We need all of you to be our partners, to share our hopes, and to help us build and grow the community of God’s kingdom here in East Tennessee and throughout this country. The brochures in the pews illustrate how our Annual Paulist Appeal supports the important work of priestly formation, our seminarians (some of whom you know personally). Our Annual Paulist Appeal supports this important he work of priestly formation, which is essential for our future; it supports our mission and ministries in the present; and it helps the community care for our senior Paulists, some of whom have served here in the past. If you have already been contacted by mail and have already given, I thank you. For everyone else, there is an envelope attached to the brochure and there are larger, easier-to-use envelopes in the pews. Whatever or however you may plan to give, please take the time between now and the collection to check the boxes and fill in the blanks, and put that envelope in the 2nd collection. Again on behalf of all the Paulists Fathers from senior ministry to our students and novices, I thank you for your support of the Paulist Fathers past and present. Homily for the Annual Paulist Appeal, Immaculate Conception Church, Knoxville TN, the 3rd Sunday in Ordinary Time, January 21, 2018. In a more normal time (which no longer exists and may never return again), the first anniversary of a presidential administration might be the occasion for a balanced assessment of the new president's accomplishments (or lack thereof). But, of course, these are not normal times, either for the presidency of for the country as a whole. In a more normal time, in a more normal presidency, the prospect of a government shutdown on the very eve of the administration's first anniversary would probably have been viewed as an appalling prospect (as indeed it should be). In the current climate, it is just part of the way things are now. The disgrace of Congress's unwillingness to fulfill its most fundamental responsibilities merits little more than a shrug. As it has been experienced in this first year, the Trump presidency presents two particular types of problems, which invite two opposite responses. The first concerns the president in particular, his unconventional behavior, his seeming ignorance of and apparent indifference to traditional norms of democratic politics and the expectations of his high office, and the corrupting effect of all of this in terms of governance, democratic deliberation and debate, and the very existence of commonly shared standards or truth and political expectations. The almost inevitable response to this, of course has been an unrelenting preoccupation with the person of the President. with worry about his personality and/or opposition to him personally dominating the discussion - largely to the neglect of a preoccupation with his and his party's policies. The second problem, however, concerns precisely those policies - more precisely how this President has empowered his party's destructive political agenda, some of which (deregulation, hostility to immigrants, etc.) has already been successfully implemented.and more of which (e.g., attacks on Medicare and Medicaid) ominously threatens. The right response to all of that, of course, should logically be a focus precisely on those policies and a strategy to disempower their policymakers. The problem is that the two responses conflict with one another. President Trump's behavior has been both offensive and erratic. That has gotten in the way of his being the post-partisan "populist" alternative to our stagnant "establishment" politics that some hoped he might be. Instead, he has largely empowered his party's political agenda, which is anything but "populist." Leonhardt argues that, just as Berlusconi’s opponents did better when they treated him as a normal politician and criticized him on substance (because Berlusconi’s actually agenda was unpopular), so too the opposition would do better by focusing on policy issues that could win over certain voters. "A focus on economic issues will almost certainly be more effective than a focus on personality. But the question isn’t just personality versus policy. It’s also which kinds of policy Democrats emphasize. And economic issues are much more likely to be effective than cultural issues, even if Democrats rightly feel passionate about cultural issues like immigration and Trump’s racism." As we begin the second year of the Trump presidency, that sounds like advice his opponents need to take very seriously if their goal is actually to make political change rather than merely make noise. So accustomed have we become - thanks to HBO et al. - to uncivilized vulgar language in situations where it would not ordinarily be expected, it was inevitable that real life would soon start imitating the vulgar corrosiveness of cable TV language. Thus the foul-mouthed town mayor in season one of HBO's The Leftovers prefigured the real-life vulgarity of our current Head of State. But beyond vulgarity, other questions clamor to be asked in the wake of the President's now infamous comment. How, for example, do we - and how should we - think and speak about problematic places in the world? Immigrants have come to our shores from all backgrounds, for all sorts of reasons, and from all over the world. But, at an given time in our national history, immigrants have been especially likely to have arrived from problematic situations in problematic places - for example, mid-19th-century Irish immigrants from famine-devastated Ireland, or late-19th-century East European Jewish immigrants evading Russian pogroms. The immigrant group I know the most about - Southern Italians - came in greatest numbers in the aftermath of the unification of Italy, when the only real solution the newly united Kingdom of Italy could offer to the predominantly poor population from southern Italy and Sicily was immigration (whether to the US or to Argentina or wherever). Nor should anyone ever forget that, then as now, many of those immigrants were quite unwelcome by many of those already here, many of whom perversely identified America with their particular ethnic identity and who demeaned the places those immigrants came from (not unlike the attitude of our current President). In spite of that, immigrants from problematic situations in problematic places came and thrived in this country - as has continued to happen with more recent immigrants from the places the President insulted. That said, another obvious next question is: why Norway? Why would anyone expect immigrants to come to the United States from contemporary Norway? 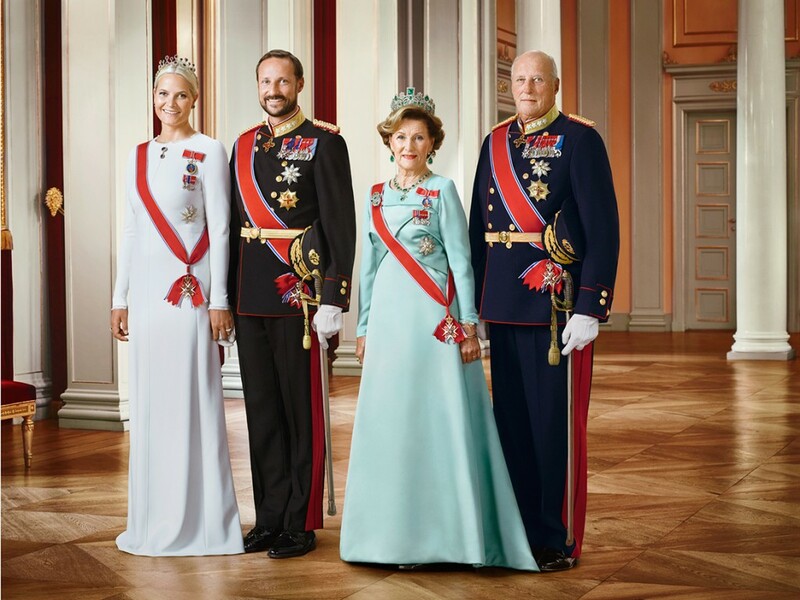 The modern Kingdom of Norway became independent in 1905; but, as a nation, Norway has existed with a distinct identity since at least 872. According to the World Bank and the IMF, contemporary Norway has the 4th highest per capita income in the world. Its citizens enjoy social security and universal health care. Its government is considered one of the world's most democratic, and its people among the world's happiest. So the obvious question becomes: if there were to be any significant amount of contemporary immigration between Norway and the US, which would be the more problematic place? From which country's problems would immigrants seek to escape? 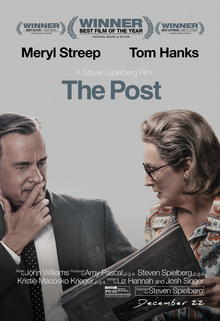 Steven Spielberg's The Post, starring Meryl Streep as Katharine Graham and Tom Hanks as Ben Bradlee, recalls The Washington Post's involvement in the epochal conflict between journalists and the US Government surrounding the publication of The Pentagon Papers in 1971. The Pentagon Papers (for anyone who may not remember) was actually a study prepared by the Defense Department of the US-Vietnam relationship over the period from 1945 to 1967, leaked to the press by Daniel Ellsberg, who had been involved in the study Although it was the Nixon Administration that fought to stop their publication, the documents themselves focused on the two decades prior to the Nixon Administration - the presidencies of Truman, Eisenhower, Kennedy, and Johnson. Their significance was in revealing the full scope of US involvement in the region with little expectation of ultimate success - suggesting in effect a decades-long failure of policy and a pattern of persistent government deception. The publication of the Pentagon Papers further helped to undermine whatever credibility US policy in Vietnam may still have had by the 1970s. So, even though it was previous Administrations whose failures were detailed int he papers, the Nixon Administration tried to halt the papers' publication, which embroiled it in a legal case against The New York Times and The Washington Post, a case which quickly went to the Supreme Court where the government lost and the newspapers won by a vote of 6-3. The publication of the Pentagon Papers and the subsequent court cases constituted a watershed event in the unravelling of the American policy in Vietnam and the unravelling also of the credibility of the government. It marled a major moment in the creation of the adversarial culture between government and media (soon to be reinforced and institutionalized by Watergate) which has largely existed since then. Whether that has been entirely beneficial is a question that needs to be asked, although there can be no doubt that the unmasking of the duplicity underlying American foreign policy in regard to Vietnam was a great and much needed service. That, followed soon after by Watergate, definitively altered the balance between trust and distrust in our culture - a mixed blessing at best, as tan adversarial culture of mutual mistrust has spread to virtually all institutions and relationships in society. Given the importance of the events recounted and the stellar cast, the film succeeds in its purpose. It is also a window (for those who don't remember) into the early 1970s and into the cozy (corruptly cozy?) relationships that existed among governmental and media elites. Paraphrasing Lord Acton, elites are corrupt, and elites being cozy with each other corrupts absolutely! That should be kept in mind whenever the press engages in its favorite pastime of self-righteously lecturing the rest of us on how essential the press is. There is a bit more of that in the film than anyone needs to hear - especially coming from, of all people, Ben Bradlee. The characterization of Katharine Graham is especially superb. (What else would one expect form Meryl Streep?) We watch her grow in her self-confidence as leader of her company, a role she had not originally expected to play and which the mores of the time had not prepared her for - in the process helping to transform The Post from a local newspaper to a national media treasure. Amid all the authentic outrage (and also predictable virtue signalling) over yet another bizzarely crude comment by President Trump, Tomorrow, Sunday, January 14, is appropriately observed as the World Day of Migrants and Refugees. In his column, Fr. Hunwicke acknowledges the obvious advantages of the contemporary British Catholic experience of large parishes: "One priest with one Church and a decently sized carpark and faculties to trinate can serve a large area, and do so economically. Rural Anglicanism, on the other hand, often functions with one priest serving six or more congregations the size of which may vary." Recognizing the "resilience" of the Catholic model, he nonetheless recognizes its potential weaknesses: "It means that you might well not know the worshipers with whom you so cheerfully 'exchange the peace'." "The old culture of the community church, the Church of a community which worshipped regularly together," Hunwicke contends, "had a beauty as well as a theological strength to it. And one of the things which has weakened it is the Vigil Mass." "Only God knows the tally; how many people the Vigil Mass culture has retained in the practice of the Faith; how many it has lost because of the weakening of communal links. No sane person would want to step back from it, however much we may sense a certain dreariness in the sight of all those people 'getting it out of the way' so that they can be 'free' on Sunday. And, however much we explain to ourselves and to others that the Liturgical Day begins with the Eve, we all sense that Saturday Evening is not ... really ... instinctively ... Sunday. ... The experience of a whole community, wearing 'Sunday Best', strolling down in families to their Parish Church as the bells ring on a Sunday morning in which secular pursuits have been set aside has, I am convinced, much more value to it than mere romanticism, or (as you are probably intending to explain to me) nostalgia for an irrecoverable social order." Of course, if it were merely a matter of "nostalgia for an irrecoverable social order," then there would be little point to it. There can be little doubt that that past social order is indeed "irrecoverable" in our current secular, consumerist, capitalist culture, which will always value private profit and convenience over other seemingly more esoteric concerns, such as those represented by religion. The dilemma Churches have been left with is not to try to recover some transient past social order (which in its own way may have been as morally flawed as any other social order) but how to salvage the religious and spiritual significance of Sunday - the admittedly temporary setting aside of secular pursuits - from the ravages specifically inflicted upon it by of our contemporary love affair with commercial, consumerist capitalism and its manifold material benefits. In his 1998 Apostolic Letter Dies Domini, Pope Saint John Paul II recalled the famous response of the early 4th-century African martyrs of Abitina on the necessity of celebrating Sunday Eucharist. In his homily at the 2005 Italian National Eucharistic Congress, his successor, Pope Benedict XVI, similarly recalled that story recounting in greater detail the famous response of the martyr Emeritus to the proconsul: "Sine dominico non possumus, Without the Sunday Eucharist we have no power. We cannot live without joining together on Sunday to celebrate the Eucharist. We would lack the strength to face our daily problems and not to succumb." In Sunday's NY Times, Columnist Nicholas Kristoff reminded us of much of the real good that happened around the world in 2017 - a wholesome corrective to our excessively politics-obsessed and America-centric tendencies. That said, 2017 was in so many ways a terrible year for the United States (and for the world to the extent that the world depends on continued American participation in international life). It was with that sad awareness that I read Michael Wolff's perversely entertaining, new best-seller, Fire and Fury: Inside the Trump White House, this past weekend. Of course, anyone who came of age in New York in the same years as Donald Trump has known - almost since forever - that he was singularly unqualified for the Presidency (or any other public office). So what is purportedly the book's principal "revelation" really is no revelation at all - although its implications and consequences in terms of how those around the President try to cope with and compensate.for the President's unpreparedness does make for somewhat interesting reading. Michael Wolff is considered an unconventional journalist, and some journalistic purists may disparage his product. Be that as it may, the book works and has had the effect it has had largely because enough of it rings true and reflects what has already been widely whispered (or shouted) in the past year. And, of course, it helps any author when the President of the United States tries to ban your book! What surer guarantee could there be that a book will be a best-seller when the President tells people not to read it? On the other hand, the real story of 2017 - and the greater calamity - has been how successful this Administration has in fact been in certain respects, in particular how it has empowered the Republican Congress to do as much damage as it has done, most notably through its recent tax bill. Indeed, one of the ironies is how the publication of this book seems to have hardened the split between President Trump and his one-time adviser Steve Bannon, paradoxically bringing Trump and the Republican Establishment closer together, thus strengthening the latter at Bannon's expense. Sidelining Bannon undoubtedly has its benefits, but empowering the Republican establishment does the country no favors either.. Whatever his multitude of faults, Bannon did recognize the Republican establishment for what it is, charmingly noting (according to Wolff) how "[Paul] Ryan was created in a petri dish at the heritage Foundation." 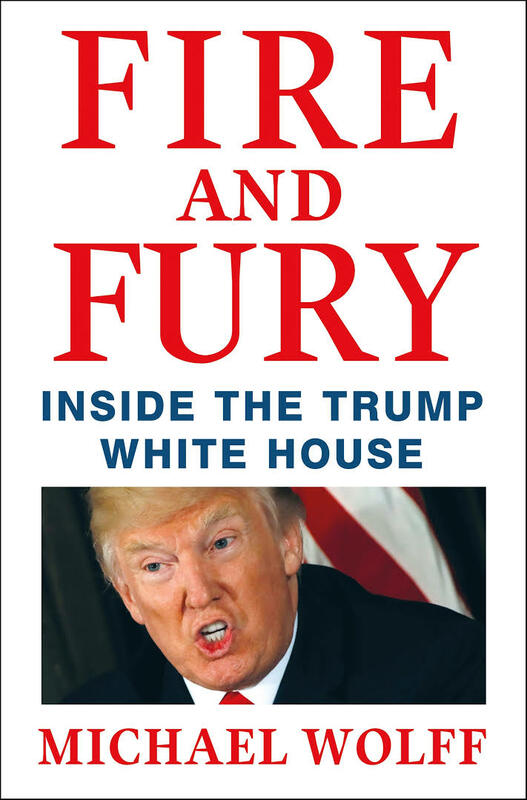 Prescinding from the President's personality (which admittedly is what makes the story), the book in part resembles a traditional journalistic account of West Wing competition and factional infighting, which is actually quite interesting. 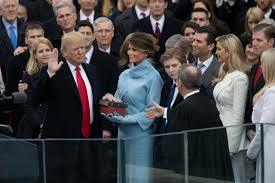 The three principal factions which Wolff identifies competing around Trump are the Wall Street Democrats (Jared and Ivanka), the establishment Republicans (Reince Priebus, Sean Spicer, Congress), and Steve Bannon.- "Bannon taking an absolutist base position, Priebus aligned with Ryan in support of the Republican leadership, and Kushner maintaining, and seeing no contradiction in, a moderate Democratic view." It is, of course, the curious interaction between this ideological factional in-fighting and the President's personality which has produced the curious outcome that was 2017. "The paradox of the Trump presidency," Wolff notes, "was that it was the most ideologically driven, and the least. It represented a deeply structural assault on liberal values - Bannon's deconstruction of the administrative state meant to take with it media, academic, and not-for-profit institutions. But from the start it also was apparent that the Trump administration could just as easily turn into a country club Republican or a Wall Street Democrat regime. Or just a constant effort to keep Donald Trump happy." Overall, however, the main takeaway from the book is what is perhaps the most extreme example yet of one of the more dangerous tendencies in modern American politics - the electorate's empowerment of political outsiders. As Wolff notes at one point, "There was a lack of coherent message because there was nobody to write a coherent message - just one more instance of disregarding political craft." The other impression one takes from Wolff's book is just how appallingly so many of the people involved in our contemporary politics seem to behave, which itself seems not unrelated to the increasing power of money in our politics. "In an age when all successful political candidates are surrounded by, if not at the beck and call of, difficult, even sociopathic, rich people, pushing the bounds of their own power - and the richer they were, the more difficult, sociopathic, and power-made they might be," observed Wolff, referring especially to Bannon's backers, the Mercers, but expressing a sentiment it is easy to apply quite generally after reading this account.